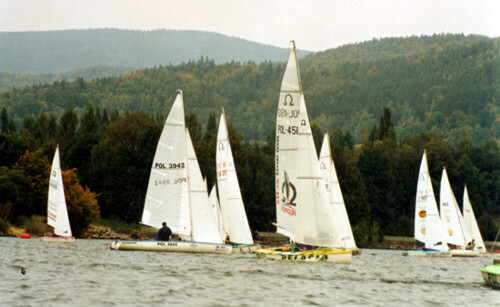 Narwal Sailmakers | Szycie żagli i pokrowców do jachtów turystycznych i regatowych. 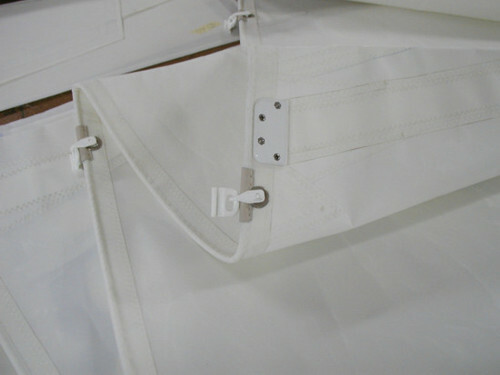 Sails can be made in various cuts. We show here the most common. Not every type of cut fits every sail. In a previous article on staysails I described some of their types (large light-weather staysails, heavy-weather staysails – working jibs, etc.). 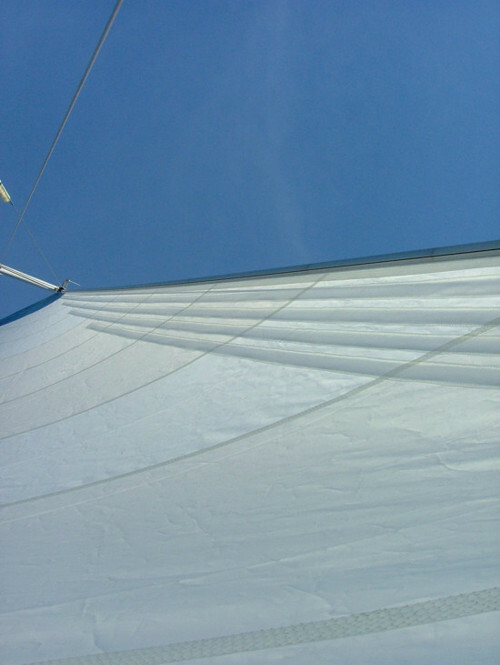 In a discussion on the mainsail, I will focus on one sail, which should serve us for the widest possible range of winds. As the text below is intended for a wider group of readers, I will not get into the topic of light-, medium-, and heavy-weather mainsails because it is an issue for a small group of readers i.e. professional sailors. 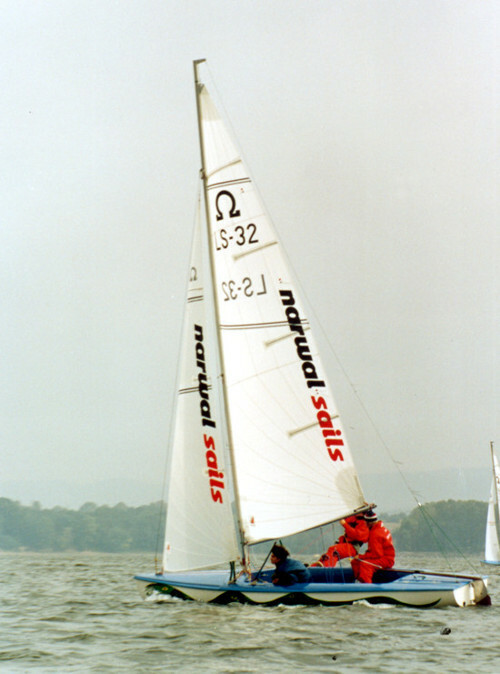 Most sailors have to deal with one mainsail on the boat and therefore can only use the sails available on a particular boat. 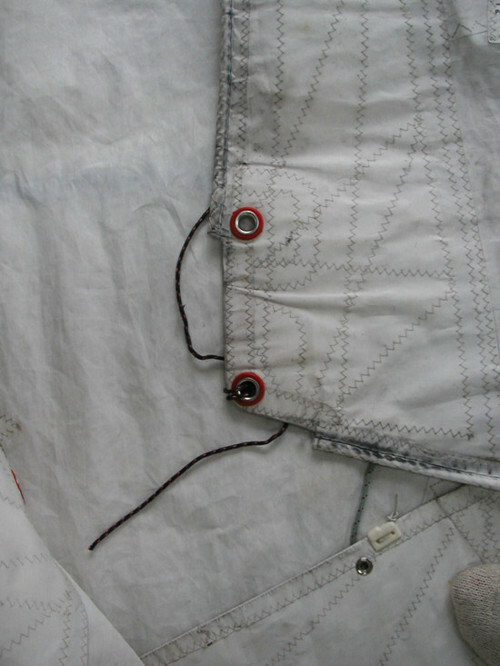 The first thing you encounter when putting up the mainsail is the bolt rope in the luff and the foot. Since I can remember, 99% of mainsails have been attached to the mast and boom by means of a bolt rope. This was always associated with problems of chafing on the corners and excessive shrinkage of sail edges as a result of use of an improper bolt rope. Chafing appears in the head, tack or clew of a sail i.e. in places that perform the hardest work in the mast or boom profiles. After some time, these places become dirty at best, and often begin to chafe, after which they break away from the sail. 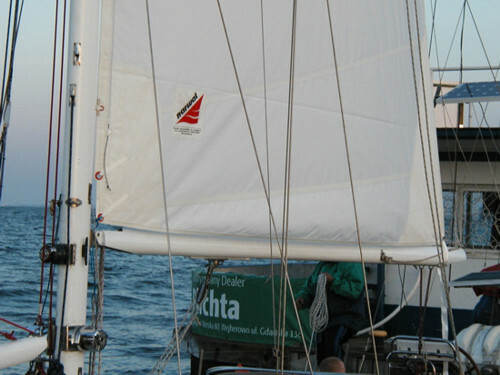 In the case of racing sails, such attachment of the mainsail to the rigging is justified due to the “leakage” of air and consequently weaker thrust. In recreational sailing, we don’t need to worry about this aspect. 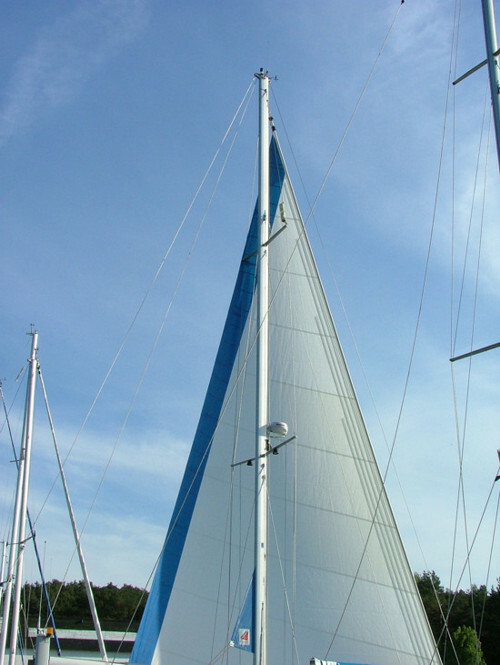 On a boat, there are so many factors allowing for enhancing the speed of a sailboat, so that it is fine to attach the mainsail to the mast using slides, which will make handling the mainsail easier while increasing its lifespan. 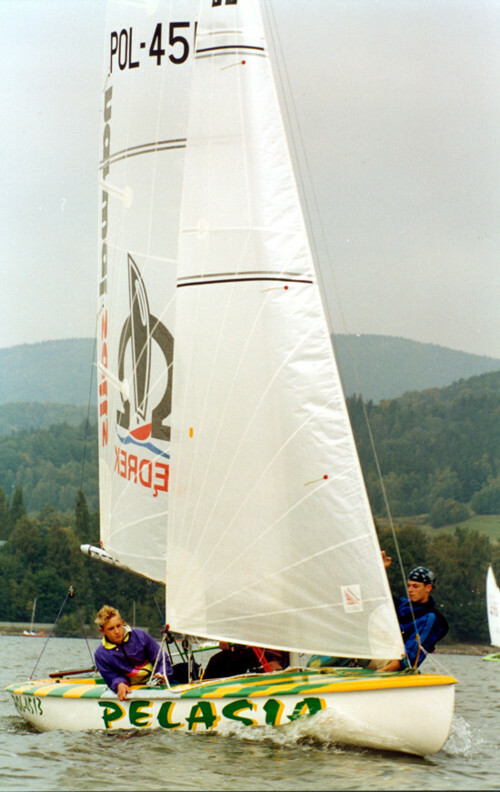 Inserting the mainsail into the mast sailtrack requires two people – one heaves in the halyard, the other inserts the bolt rope into the sailtrack. In case of slides, one person is always enough. 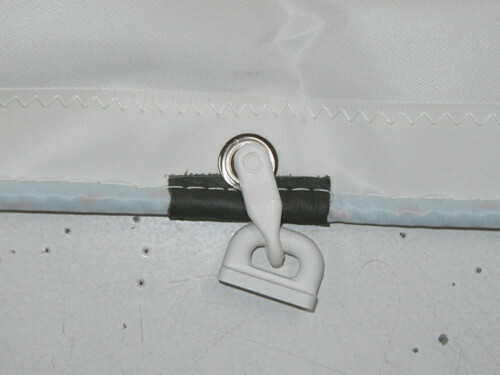 When the mainsail is outside the sailtrack, the person first puts all the slides in the sailtrack, blocks them with a stopper so they do not fall out, and then heaves in the halyard. 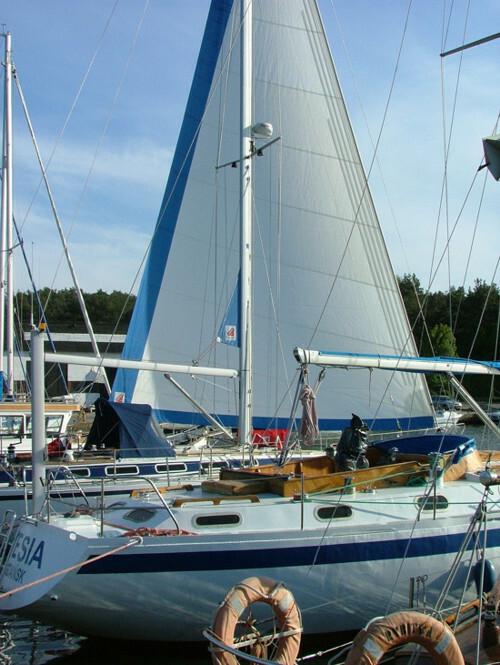 Then we can drop and put up the mainsail with no restrictions (provided that the slides will fit the sailtrack – and will not jam). 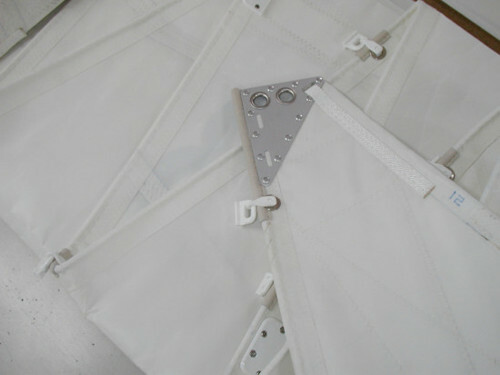 In case of mainsails with the area of 30 – 40 m², sliders with plastic clasps can be used with no problems. This is a most appropriate system, although it would seem that plastic slides will crack. Nothing could be more wrong! Firstly, there are a lot of these slides (spaced every 50 – 60cm), and secondly, when one breaks it is because there was an unexpected “event” in this section, which caused an increase in the force pulling out the sail from the track to the limit. Cases a) and b) result in a visit to a sailmaker’s shop for repairs. It is possible to fix this on one’s own, but it will not look good, and the guarantee that our repair will be sufficient is smaller. In case c) the repair comes down to taking out a spare slide or snap from the secret compartment, replacing the defective element and sailing on! (Where the wind??). After a week of sailing the same customer calls us and confirms that our justification for this solution is completely right and that he already likes it. This situation occurs frequently … and what is our justification? 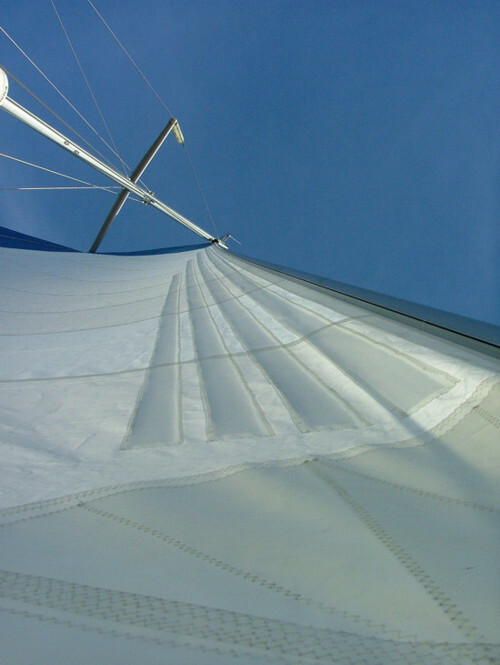 the notion that the bolt rope at the foot of the sail sustains the boom over its entire length is wrong – the supporting force is only present at the point of attachment of the clew. 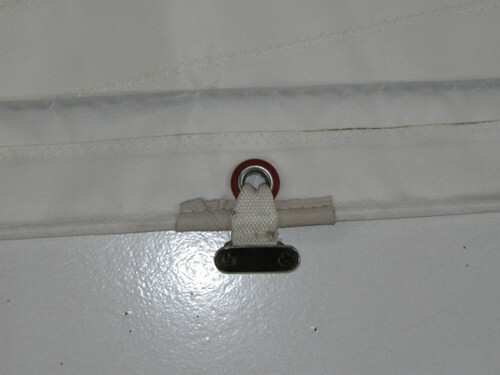 When a bolt rope is used, it only closes the space between the boom and the sail for the escape of air from the lower part of the mainsail. How much air really escapes that way? In the case of recreational sailing, you can skip this question, because this is not the way to increase the speed of your sailboat. 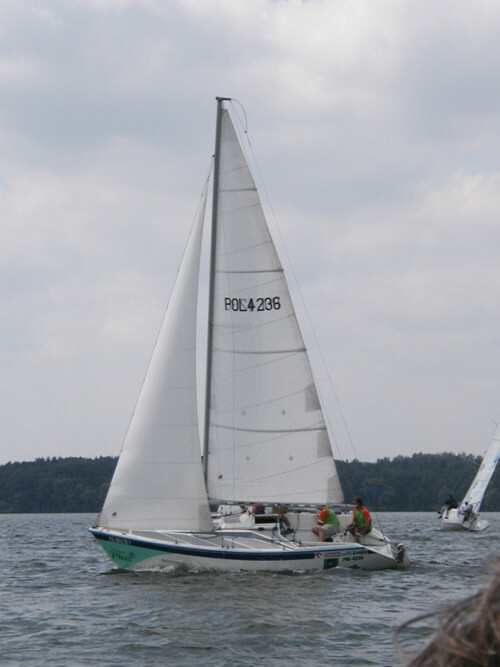 On the racing Omega class sailboats, where we use this solution, there is not an element which decides about victory, it does not bother anyone, and in some moments it even helps. It helps when you want to work with the foot of the sail when sailing. 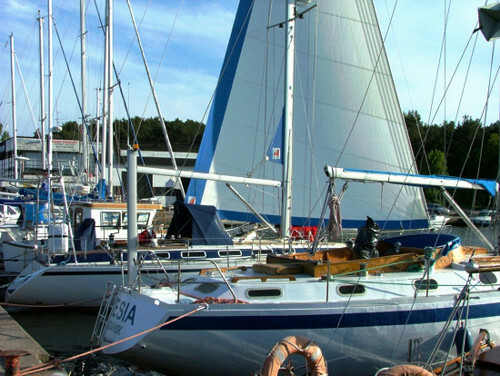 The lack of a bolt rope causes that the clew moves itself towards the mast when the mainsail is loosened on the foot, and when heaving it, there is no bolt rope resistance in the boom or stretching of the bolt rope itself. Hello again in the summer fever. However, the fever, unfortunately, results in the frantic search for summer weather. You could have experienced it for example, on the 18th of July, Sunday, on the way to Krynica Morska. During the congress in Krynica, there was a string of vehicles already in Nowy Dwór Gdański travelling at a dizzying pace of 10 km/h to their desired destination by the sea. This line of cars on the main road in the direction of Elbląg was about a few kilometres long. In the evening, the same situation existed in the other direction – from Krynica towards Elbląg. Half of the day in the car….. ugh. The fortunate owners of sailing equipment (engine and wind powered) can at the moment appreciate owning their own (or chartered) means of transport. On the water it can also be crowded but not to this degree. In order not to awaken the readers from the mood of holiday intoxication, today I will present some interesting facts, more or less useful to most fans of sailing. It shows the aluminium cleat to the trim line on the leech of the foresail of a 50-foot boat. You can guess that it wasn’t sailing on Lake Kisajn or Niegocin. Yeah, but … salt ate through it. Anodising the cleats was either done so fast, that the cleat was not aware of it, or was not done at all. The effect is visible. 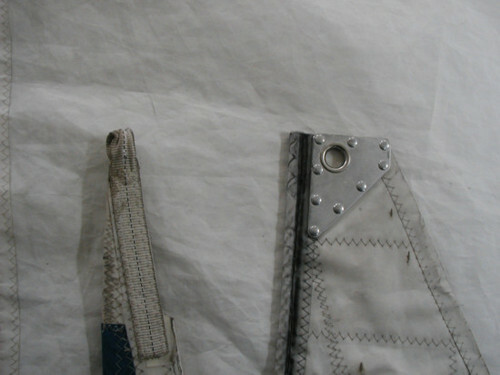 How much of the cleats crumbled during its dismantling can be seen on the floor by the sail. Trampolines are made by us using trampoline net the material espacially made for that purpose. Color of the net can be grey or black. We always make the trampoline according to the clients drawing or the layout of the previously used trampoline.